I am renting out some of my strollers. You take a plane and need a compact stroller? Family comes from abroad and you need baby essentials? Pram, carseat or travelcof? Feel free to contact me. I expect you to take care of the stroller and bring it back clean (not washed but at least wiped) and in good condition. If not, I will keep the deposit to fix it or replace it. pick up and drop off at my place in GENOLIER (1272) close to Nyon/Gland. Price list is here, in french. First amount is the deposit. Some of these items may vary. Please contact me for further informations. divers porte bébés disponibles également. Join us on Facebook, we’ll be in touch easier! 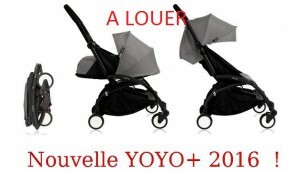 I was wondering whether your Yoyo stroller was the 0+!? If so I am very interested in renting it from June 7 to 14th and July 1st to 18th 2016. Is it available for these dates? I live near Nyon so pick up is no problem. I’m from Denmark and I would like to ask you that do you have any baby jogger ( for runner) available on 21-22 Oct17? We are going to use it for Lausanne Half-Marathon. I’m very but I am not available on these dates. I am interested in possibility to rent the Babyzen yoyo from 28th of August to 8th or 9th of September, is the stroller available for those days? Unfortunatly both my yoyo are booked for these dates sorry! I have a bugaboo bee available eventually but it is a bigger pram. willing to rent yoyo for travelling purposes for the period of 6th of sept to 10 sept. Yes I have a yoyo available but only with the 6 months and up inlay, not suitable for newborns if that’s ok. I ask for a 250chf deposit and 15chf per day or 70chf per week. Pick up and return at my place in Genolier near Nyon. please contact me at lescarrossesdeyukary@gmail.com or via facebook on “Yukary Locations”. I need a yo-yo for my 6 yrs old daughter from 17th July to 23rd July. Is that available? I would need a stroller/pram for my 6 yrs old daughter for travel purpose. Do you have one available from 17th July to 23rd July?